5 month ago I wrote for the first time about my plan to start blogging in English. A month later I tried it during my time in London. So, how do I feel about this decision today? I have to admit that I was about to end the whole experiment in September. I missed writing in German and I recognized that my articles became shorter. I had to think a lot more before I started writing than I was used to. I’d even prepared an article to explain my decision to switch back to German. My cursor was just centimeters away from the “Publish”-button but I didn’t do it. I saved it as a draft and a few days later I came up with the text about DDB’s #firstworldproblemes meme campaign. The reactions were overwhelming and the article was mentioned on Time.com, Guardian.co.uk and several blogs. It did feel like they wanted to show me how nice it could be to have an international audience. It would have never happened if I had published the draft earlier that week. I’m absolutely sure now that the decision was right and over the past 4 months I could notice an improvement in my English skills. I hope you have too. I will try to publish longer articles and write more own stuff. I think there is still a lot of potential left and that’s exactly the reason to stay hungry. And I don’t want to miss talking to a bigger and more international audience. It’s a great opportunity to get feedback and visitors from all over the world. On the other hand I don’t want to lie, sometimes I really miss writing in German. So, why should I limit myself to use only one language? Just for the purpose of consistency? Frontand.de is “just” a blog and as long as I have fun, everything should be fine. I will start writing some articles in German. When the time is right. Did you enjoy my change to English or would you like to see more German posts in the future? Are the articles too short? Are you missing anything? I definitely would appreciate your feedback. On Reddit Peter Moore, the longest held hostage in Iraq (2,5 years), answered a lot of question about his captivity. Shocking and interesting. An unbelievable machine out of Lego. 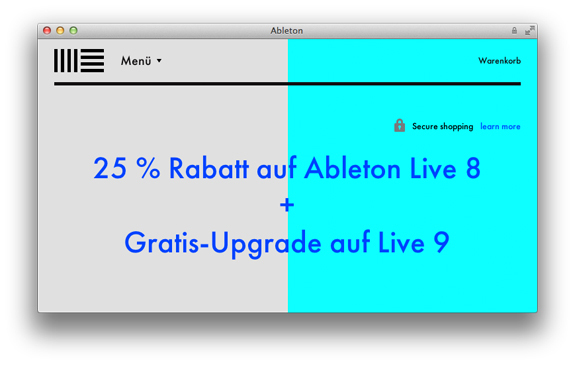 I really like the new design of ableton.com created by Edenspiekermann. In 2010 I started a little, weekly series in which I shared interesting links, articles or videos I had found during the week. I called it “Wochenend-Lektüre“. I don’t know why I stopped it after 10 episodes and so I want to restart it today with the name “Recommendations of the week”. 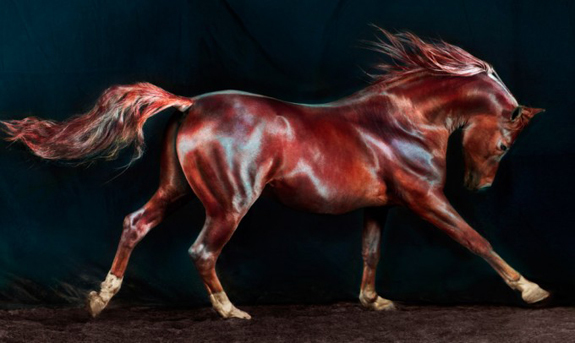 Jill Greenberg opened her new exhibition Horse. On Quora this question popped up: “What are the best stories about people randomly meeting Steve Jobs?”. Tim Smith wrote a really humorous and lovely answer about him meeting the Jobs: “I saw him in his most personal element – family and friends – around a broken down car in Palo Alto one night, just by chance. I was lucky – and I was delighted.”. 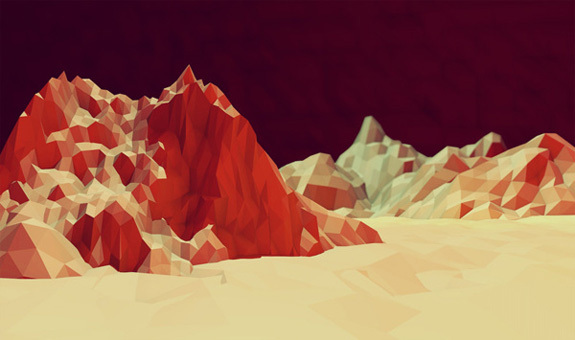 JWT created a pretty interesting list of 100 things to watch in 2012. Lightt is an app with a really interesting approach to record life. I’m not sure about calling it an Instagram killer. During Monday night’s presidential debate Ann Coulter called Obama “a retard” on Twitter . This is a great response by John Franklin Stephens, a man with Down syndrome. Loren Brichter, the developer of Tweetie, published his new app Letterpress, a word game for iOS. It’s really fun and very addictive. A nice interview with Erik Spiekermann on Design Matters. Who works with ‘Creative Coders’? Tim Stutts put together a list of companies. If you want to follow all my text recommendations have a look at my quote.fm profile. If you stumble upon interesting stuff during your week, just drop me a line. 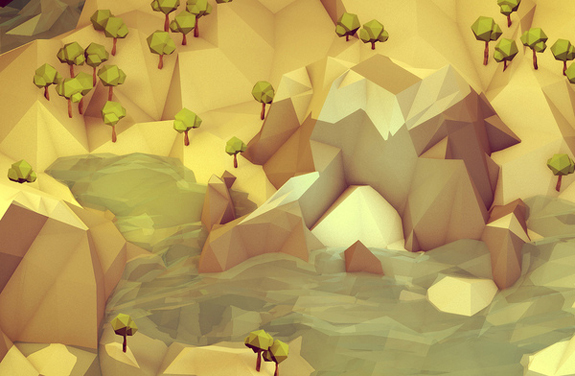 I first saw some of Timothy Reynolds’ polygon worlds on Dribbble and I immediately fell in love with this 3D low-poly style. That was about 2 months ago and in the meantime his work was featured on several big websites like The Verge, AdWeek, Design Milk, boingboing, TNW or The Fox Is Black. 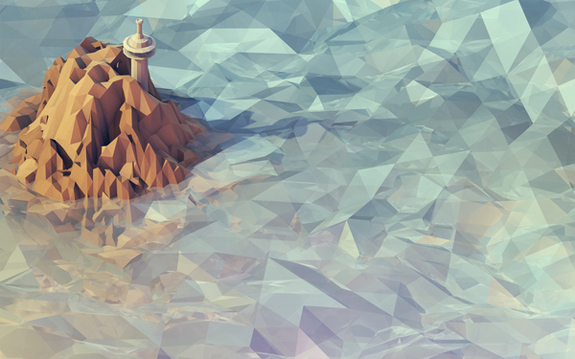 Nevertheless, I want to show his 3D low-poly worlds here, too. 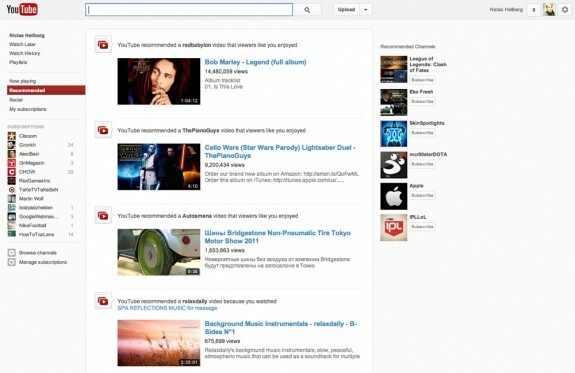 In June Google started to roll out a new design for their video platform Youtube. I wrote about it here. It is very similar to the latest redesign of Google+. Today I recognised some more changes. They’re not that big but I would say it’s enough to talk about. So, what’s new? Besides the new look of the left sidebar the entire site (including video detail pages) is left-justified now. I would love to know the reason behind this decision. 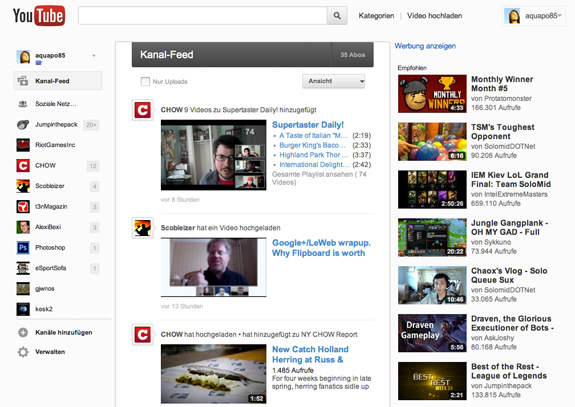 Furthermore, the left sidebar which is showing subscriptions and activities will be present on every page now. 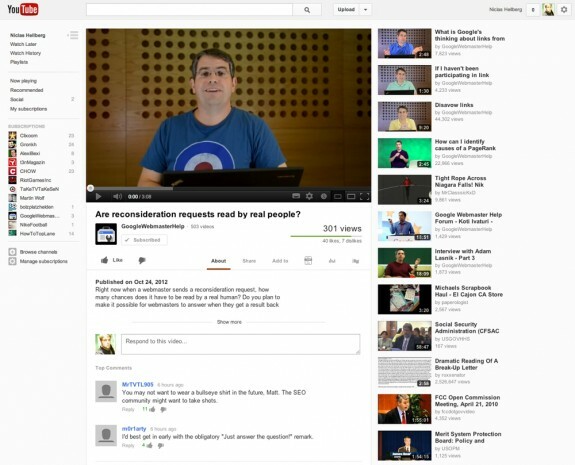 Those two changes will mostly affect the presentation of videos. The detail page which is presenting the videos. 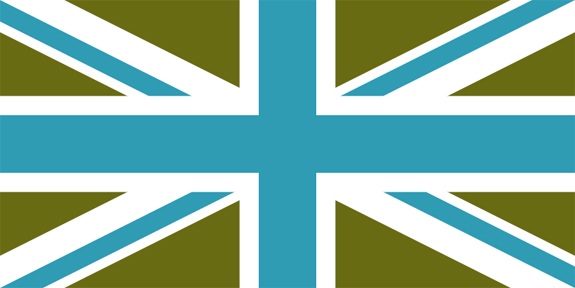 The design which was presented in June this year. An amazing lecture from the late Alan Watts. Just beautiful. In a bit more then half a year I (hopefully) will finish my studies and I’m still not sure what to do after it. What would I love to do when if money was no object? After I criticized advertising last week I want to highlight one of my favorite ads today. I stumbled upon this piece of work last month and I think it’s one of the best awareness campaigns I have seen so far. Funny enough it’s also made by DDB. The problem: In the UK half a million car crashes a year are caused by women doing their make up while driving. The idea: To generate awareness for this topic DDB arranged a cooperation between Volkswagen and Nikkie. She is one of the most famous girls on youtube, known for her make up tutorials and beauty tips. This campaign is not great because of its execution (slow motion effects have been used a lot in accident awareness campaigns). In this case the timing of the effect is just brilliant and also the setting is perfect to target the specific audience. Great work. Earlier today I checked the prices on ebay for Amazon’s Kindle Paperwhite, the awesome eReader presented in September. I didn’t order one because I hoped the prices for imports will drop in the coming weeks. 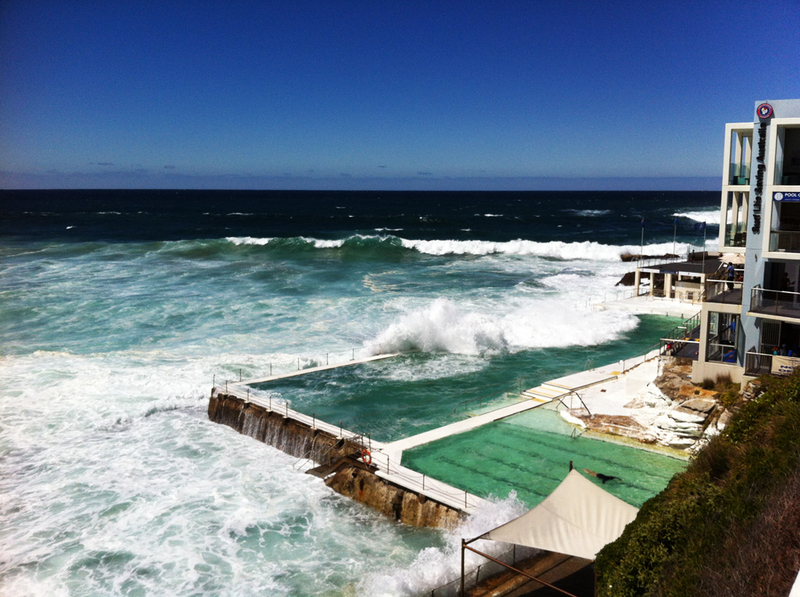 In summer I was about to buy a normal Kindle because I wanted one for our travel to Sydney. But after I read about an upcoming Amazon event and the rumors about new Kindles, I postponed my plans. When the day of the presentation came I was really enthusiastic about the new Paperwhite. It was exactly what I was hoping for. The bad news: The sale should start in October and delivery would be possible in the US only. That’s why I checked the prices on ebay nearly every day. 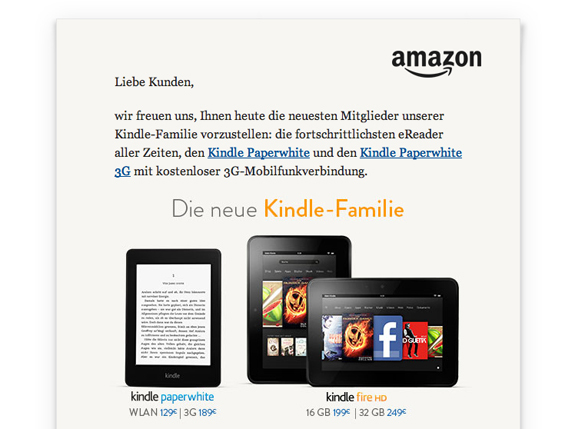 Today Amazon was surprising me a lot with its announcement that the Kindle Paperwhite (129 Euro) and the Kindle Paperwhite 3G (189 Euro) are ready for pre-order in Germany! Shipping will start on the 22nd of November (first come, first served). I already ordered mine.